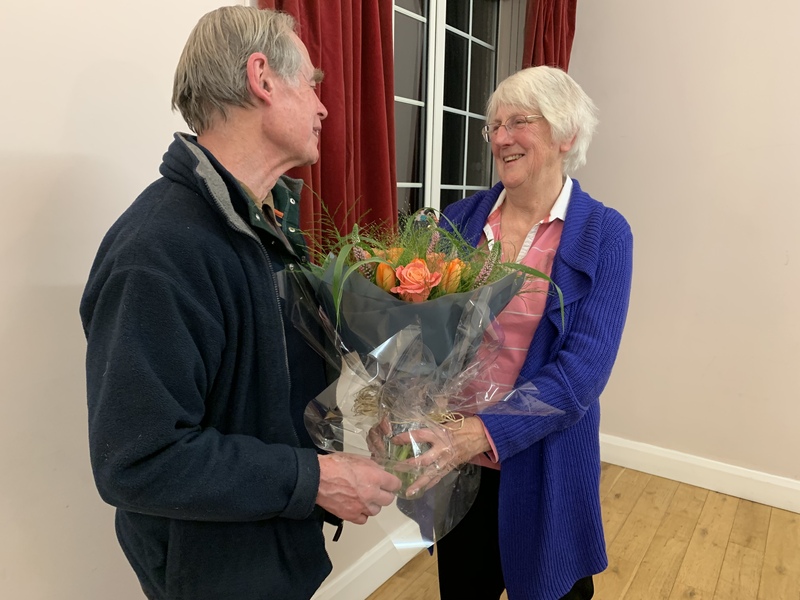 At the end of the Parish Council meeting on Tuesday 16 April our Chairman Michael Hyde presented Jackie Worrall with a token of appreciation and thanks for her long membership of the Committee of Friends of Chorleywood Common (Jackie stood down at the recent AGM). Jackie continues to serve on the Parish Council (currently as Vice Chairman) so her knowledge, love and support for the Common will continue. The Parish Council agreed that a councillor should attend Friends Committee meetings as a non-voting member to maintain the close contact and information sharing between the Parish and Friends. This role would be appointed at the Full Parish Council meeting in May when councillors are voted into which sub-committees and liaison roles they will fulfill for the coming year. Great to see those members who came last night. We had a superb presentation by Daniel Du Gard on how the Common has changed, his presentation is here (click). Then the formal AGM took place. Michael Hyde gave his Chairman’s report for the year here (click). The meeting gave thanks and expressed great appreciation to Jackie Worrall who is standing down, but all other current committee members were re-elected. There is space for more members to contribute to the committee, please contact us to find out more. After some drinks, crisps and chat, Tony Edwards, member of Parish Council and Chair of the Open Spaces Committee, demonstrated CPR and resuscitation using a defibrillator on a dummy. There are four defibrillators in Chorleywood and if you find someone collapsed and not breathing, first check it is safe to approach, and if they are not breathing call 999 and start CPR. 999 will direct you (or another passerby) to get a defibrillator and once opened the machine tells you what to do, no training or expertise is required. It saves lives. Now, get out and enjoy the Common in the sunshine! Ranger Walks and Tasks - Last Thursday of every month 10.00am – 12.30pm (ending at a pub where people can stay for lunch/a drink if they wish). In order to let our new-to-fatherhood Conservation Ranger, Daniel du Gard, return as swiftly as possible to his parental duties after his talk to us about the Common, we have re-timed the evening so the talks will be on first, then it will be concluded with the formal business of the AGM now starting closer to 9.30pm than 8.15pm. 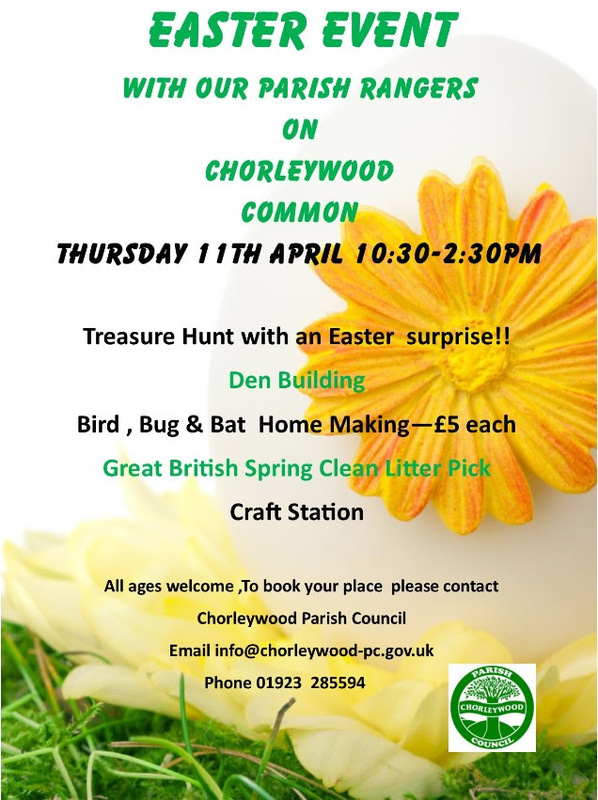 There are a number of activities planned by the Rangers and Parish Council for Easter on the Common on 11th April 2019. I expect it will start at the Cricket Club Pavilion but details will be provided on the Parish Council website. I would like to invite you to an evening where you can meet your fellow members and members of your Committee as well as attending the AGM. We would like to get to know you better and this occasion provides the perfect opportunity. Speakers will be both opening and closing the event. The evening will be held on Thursday 28th March 2019, starting at 8.00pm, in the Chorleywood Library, followed by the 28h Annual General Meeting of the Friends of Chorleywood Common starting at 8.15pm. The Agenda is here. Minutes of the 27th AGM, and the accounts for the year to 31 October 2018, are here and here . The AGM will include a review of the year by our Chairman, Michael Hyde. The AGM is also your opportunity as members to raise any matters of interest or concern. Before the AGM there will be a talk on Chorleywood’s defibrillators and after it a talk on the History of Chorleywood Common. Nikki Varnals will, but Jackie Worrall will not, be standing for re-election to the Committee. There will therefore be vacancies to be filled by election at the meeting and also the position of Vice-Chair remains unfilled. Nominations for election as Officers or Committee members should be sent to myself as secretary (petrea2@btinternet.com) at least 7 days before the AGM, i.e. before or on Thursday 21 March. If, before the AGM, you would like to query or discuss anything contained in the agenda, and in particular if you want to find out what would be involved if you joined the Committee or took office, please contact Michael Hyde (mrhyde1@hotmail.co.uk) or any member of the Committee. As an added incentive to persuade you to come out on what we hope will be a pleasant Spring evening, we shall be serving wine and soft drinks during the evening. So on behalf of the Committee, I do hope you will be able to join us at the Meeting and look forward to seeing you on the 28th March. The Parish Rangers will be leading a educational walk followed by short working party on the Common on Thursday 31st Jan 10am to 12.30. Meet as usual in the Cricket Club car park opposite the Parish Office. This activity takes place on the last Thursday of every month at the same time and place. 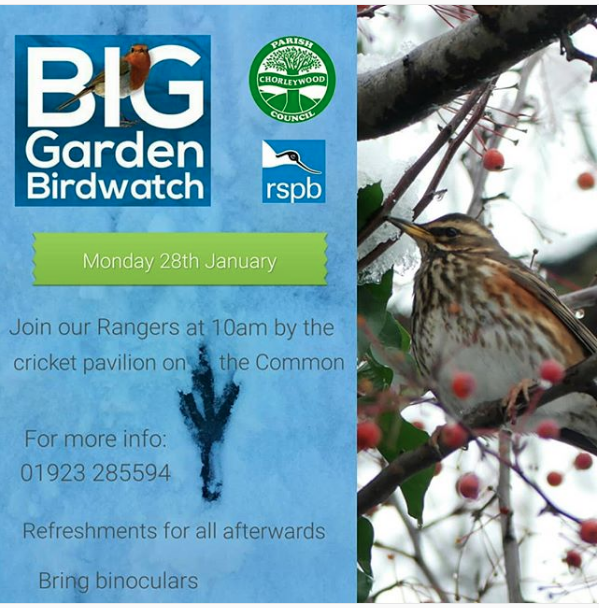 Join our Rangers on Monday 28th Jan to take part in the RSPB Big Garden Bird Watch. Meet at 10am behind the cricket club pavilion on the Common for an hour of bird watching followed by refreshments at War Memorial Hall. Bring binoculars if you can. “We thought you would be interested to know that a group of Butterfly Conservation volunteers have been walking Chorleywood Common recording butterflies throughout the summer of 2018. We now have our first year annual record of the butterflies on the common. We have attempted to incorporate the different habitats represented on the common in our route. As expected the grassland areas, and particularly the chalky bank at the south end of the common, have the greatest variety of butterflies. It’s good to see most of the common spring butterflies e.g. Holly Blue and Brimstone represented. In summer the grassland is heavily populated with Meadow Browns, Gatekeepers, Common Blue and the Whites. Interestingly there is also a large population of the day flying moths Burnet Companion & Six-spot Burnet. Although these were not actually counted, they were both very numerous. It was exciting to see the Marbled White in significant numbers. Sadly the heathland at the north-west side of the common is pretty barren from a butterfly perspective. Next year we propose to incorporate two of the woodland rides earmarked for conservation in the Chorleywood Common Greenspace Action Plan into our walk. It will be exciting to see how this affects butterfly populations. It will also be interesting to see what effect the long hot summer has had on next year’s butterfly populations given how arid the land became. There is also a possibility that we will host some guided walks for the public to walk round our route and observe the variety of butterfly life therein.